Link your laptop or mobile device to the D5520 to restart works in progress. Or use the D5520 standalone by using the Windows® 10-based controller as an embedded mini PC on which you can download your preferred business apps. Collaborate and project manage via Office 365, Skype® for Business and other cloud solutions. Bundle the D5520 with a Ricoh Digital Projector to present and interactively collaborate with large onsite groups. Begin using the D5520 in a snap thanks to its user-friendly UX that needs little or no training. There's no need to connect the D5520 to a dedicated computer requiring expensive management software and mandatory maintenance fees. Add an optional mobile stand to easily move the D5520 and convert any area into a collaborative space. If you want to use the D5520 as a display only, you can connect endpoints via VGA, HDMI, DVI-D or DisplayPort. Present complex graphics and convey your ideas clearly in crisp 1920 x 1080 HD resolution to audiences sitting up close and faraway. 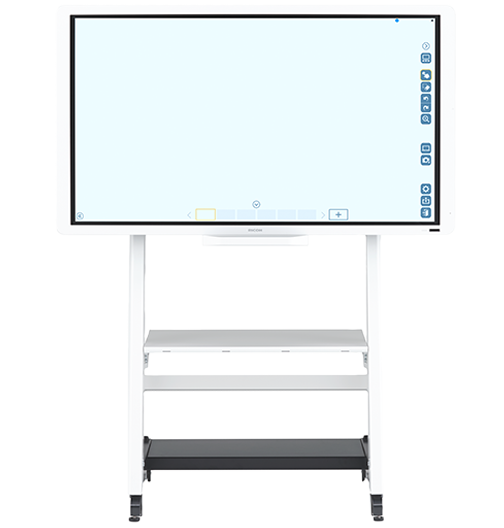 Help participants see what is on the screen in almost any lighting conditions with the D5520's anti-glare touchscreen, penetrating LED backlighting and adaptive contrast with dimming control. Make precise mark-ups and natural drawings on the D5520 with advanced ShadowSense touchscreen technology.